Planning a family vacation trip with teens is often not an experience many parents enjoy. Teens by definition are stubborn and on the verge of breaking away from the family to become independent and on their own. So why are parents doing this with their offspring? Aside from the experiences you are giving your child and memories you are creating, this may be perfect timing for a family who has become distant from each other to once more come together. Parents often feel the they want to enjoy their children in the short time they have left as soon their child will be leaving the family home. The parents may want to try to bring back once again that family feeling of closeness and support. Family trips with teens can work well if you work with some of these hints below to get your teenager involved with the family vacation getaway. * Have your child share his/her ideas while talking about the family trip. What are their thoughts about the destination and mode of travel? What thoughts do they have in the schedules that are being planned? * Give them some leeway in helping with the planning. Most teenagers are computer literate and enjoy surfing the net. Let them be your travel agent. Have them search for the lowest discount price on plane tickets, hotel rooms and any other package deals that apply. Tell them what your budget is and as an added incentive, pay them a percentage of the money they save you if they come up with some great prices. * If it is in your price range, allow for accommodations that will allow some privacy for your teenager. This will go a long way towards making your vacation a positive experience. Some personal space will be cherished by both parents and teenagers. * Get an atlas or road maps of the area you plan to visit and study them together to become familiar with the area before you go. Have them look up the area on the internet and write down activities or local attractions they would be interested in visiting. * Rent some movies that have that area as a background to get a feel for the locale i.e., The Sound of Music, Under the Tuscan Sun, etc. There is an abundance of movies with locales in Florida, Maine, California, Midwest, National Park backgrounds etc. * If going abroad, get some language Cds and practice basic phrases with each other at the dinner table. Even the youngest children can pick up Please and Thank You. This will go a long way toward enhancing your family vacation (and it will certainly make points with the locals). 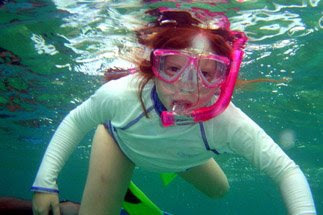 *During your vacation, let the teens select some of the activities for the family to do together. Maybe they just can't visit another local attraction or historical site. Give them some free time to do things of their choice and you'll find them to be more easy going and more apt to defer activities you would like to do. You will probably find that because of this space you give each other, you will be better able to enjoy each others company. *Maybe you could allow your teenagers take turns deciding on an activities for a day. Let them select the activity, where to eat and what local attractions to visit. This will give your teens a sense of responsibility and confidence. It will also give them a sense that they are an respected part of the family. *Allowing all family members to have some input when traveling as a family will bring a new experience to the family vacation. You may even find yourself doing some activities you would never have done otherwise. The final decisions rest with the parents, but if you invite your teenagers to be part of planning they will feel they have a voice and their opinions are important. Because they feel they have had a say in the decision making they may be more disposed to the notion of a family vacation. In the end, your teenagers may also find they have actually enjoyed both the family vacation and spending time with their parents. Gloria Daniels is the mother of six children and having 9 grandchildren and 1 great grandchild. As such she has done her share of traveling with children. Now that I she is retired, she is combining her love of sharing and teaching with her love of travel to help other families find the joy of traveling with their children and sharing experiences with them. Visit her website at Best Family Travel Tips for more great hints on planning family vacations and traveling with children of all ages.